Mike and other architects were interviewed about their thoughts on the Masters, Augusta National, and which major is the best. Mike was featured in Links’ article about the pros and cons to designing new versus renovating old. A discussion with leading architects about the spectrum from minimal to maximal site interventions. Mike is featured near the end of the article. Check it out! Golf Advisor has put out their Best of 2018 Lists, featuring Pilgrim’s Run as #5 in the country! Greywalls and Diamond Springs also join Pilgrim’s Run on Michigan’s Top 25 with Pilrgim’s Run also being chosen for friendliest staff! Tony Paul of The Detroit News, called Pilgrim’s Run an “impressive hidden gem” in his review of the Golf Advisor ratings. Diamond Springs also gets a mention in other local highlights. Andy Johnson of The Fried Egg wrote a “gushing” article about Diamond Springs. Pilgrim’s Run and The Mines are mentioned in the Grand Rapids edition of “Where to Golf Next.” Read the article to learn about other great courses in the area and where to go afterwards for a well deserved local craft beer. Golf course architect Mike DeVries is overseeing a pilot project at Flint Golf Club in Michigan, USA, to restore lost features of the original Willie Park Jr design. 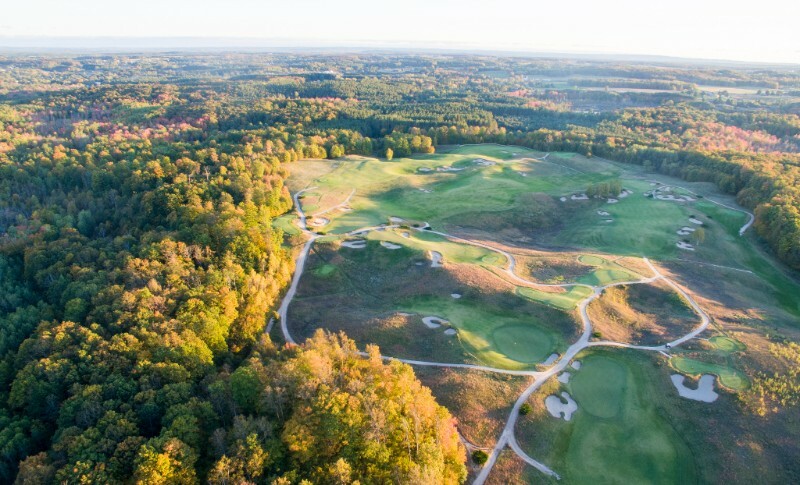 Diamond Springs and Greywalls are highlighted, and the Mines and Pilgrim's Run are mentioned, in Michigan Golf Journal's Fall Tour section by Tom Lang. The list contains courses that allow you to soak in the gorgeous colors of the changing leaves while playing some great golf. Is there a better way to celebrate the changing seasons? Check out their September issue and set up your tee time today! Three DeVries Designs’ courses are mentioned in Andy Johnson’s list of “Bang for your Buck: Michigan.” It features courses from across the state that all cost under $100 and have regular tee times for the public. Golfweek came out with their latest rankings featuring 3 DeVries Designs courses. Ben Cowan of The Walking Golfers Society did a Q&A with Mike. Tom Lang wrote an article about Mike with a closer look into Greywalls and Diamond Springs. "Like many golfers, course designer Mike DeVries of Traverse City is a huge fan of legendary designer Dr. Alister MacKenzie...DeVries grew up in Northern Michigan's Frankfort area, home of MacKenzie's masterpiece at Crystal Downs." Mike featured on Feed the Ball podcast! Kingsley Club in Northern Michigan is a modern marvel of minimalist architecture. Architect Mike DeVries moved only 30,000 yards of cubic dirt to construct the course. That's a fraction of a normal course. The minuscule amount is jawdropping when compared to Whistling Straits which moved over 1 million tons of earth! Kingsley's sandy soil and fescue fairways promote firm and fast conditions and highlight the natural land.